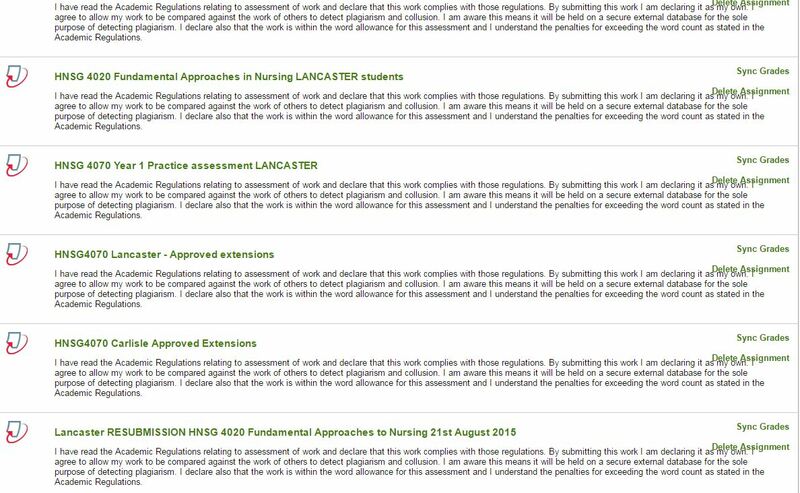 As part of the 2018 Blackboard Updates, the new process to guide you through the steps of applying a template and copying selected content to your new Blackboard site is now in place. All 2018/19 courses will open with the wizard by default. Although it is a quick and straightforward process, we have produced this walkthrough guide and video for further information. On a basic site, apart from the time element, this would take about 45 clicks to set-up each site! To apply a new programme template at the same time would take even more time and complexity – and clicks. The wizard will apply a template and copy selected content from a previous course (where available), and all from within the same Blackboard site – with far fewer clicks. This new process further strengthens and develops the links between Blackboard and SITS. This is the first iteration of the wizard, and it is hoped to develop it further over time. Having run the wizard, you will still be able to copy items from other courses, if needed. This entry was posted in LT News, News and tagged Blackboard, Blackboard 2018 updates, learning technology. Many of the protocol areas are straightforward to apply, and can have a positive impact on the site. AQD have put together a few “quick wins” for checking and applying some of these areas. AQD have also produced a getting started with Blackboard guide and a module checklist which could also be useful. AQD can help support teams with their use of learning technology to enable and support learning. Please contact AQD to discuss. There is an easily located introduction to the course and/or Blackboard site Add the module aims as an item within the Module Information section of the site. This text can be expanded to include other relevant information regarding the structure and running of the module. Staff contact information is available in its own area Ensure that up-to-date contact information is available. Include contact details for relevant support services. Announcements are being used effectively Add announcements to alert/remind students of new topics within the course. There is a link to the programme site on the menu Add a link to the programme site on your module’s menu – ensuring that the programme site is active and up-to-date. There is an Assessment menu item, with information and submission points Add assessment criteria and learning outcomes to the assessment area. Learning Outcomes are being displayed around the site (outside of the module guide) Copy the learning outcomes from the module handbook and paste them as an item in the Module Information area, and also add them to other relevant sections, such as the assessment area. The module handbook is available Ensure that the current module handbook is within the Module Information area of the site. The document needs to be in a format that students can easily open and access, such as PDF. An appropriate use of .pdf Check the files that are located on the site; many file types (such as Word and PowerPoint) can easily be converted to PDF which can then be uploaded onto the site. This entry was posted in Good Practice, LT News, News and tagged Blackboard, learning technology, protocols. The Bristol Online Surveys (BOS) service migrated to Jisc in October 2017. Jisc has recently announced that the service name, and site branding, will shortly start to change from “BOS” to “online surveys”, with all changes being completed by the summer (2018). This entry was posted in LT News, News and tagged jisc, learning technology. iLead iLearn Webinar Series – Using PebblePad with your Students. 30th January 2018. The session started with a refresher of what PebblePad is and its development over the years. PebblePad is the market leader in the ePortfolio world and we have been using it at UoC since 2005. All staff and students have accounts at UoC which can be accessed from the Staff and Student hubs and even from within Blackboard itself. The system is complemented by a wonderful app, PebblePocket, which is free from Google Play and iTunes. If anyone leaves the university, they can register for an alumni account, which is free forever. We outlined a few of the many ways PebblePad can be used: creating a wide variety of assets such as portfolios, blogs, activity logs, or by creating assets from the in-built templates provided by the system. These assets can then be shared with other PebblePad users or those without PebblePad account. Items can also be created and provided with a weblink which the intended audience can click on without the need for a username and password, so it’s also an excellent web publishing tool. We then continued to talk about how PebblePad can be used for assessment and the various ways of getting the best out of students. Custom templates can be designed (workbooks) – usually by academic staff – which can provide the student with structured scaffolding on which to build their work. We also looked at the many ways of giving feedback – both formative and summative. The session ended with a quick demonstration of how to easily add items to PebblePad and we had a glimpse of some good examples of templates currently in use at the University of Cumbria. 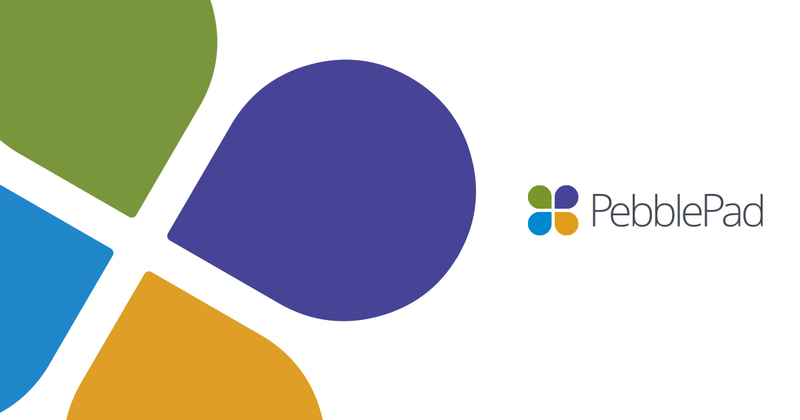 Once users login, PebblePad provide lots of in-built support via their homepage (called the Learning Centre) and we in AQD have supplemented this information with various articles and helpsheets via our TEL Knowledgebase which can be found here. Anyone interested in using PebblePad with their students is encouraged to contact aqd@cumbria.ac.uk to start off interesting conversations! This entry was posted in Staff Development and tagged learning technology, PebblePad, Staff Development, Webinar. The session started with a brief recap of how Blackboard usage has grown at the university, with the system now being classed as “mission critical”. A move to module-site delivery and a consistent approach resulted in a set of protocols being developed, and these were shown during the webinar, along with other support available, such as a staff-facing knowledgebase. Access to these resources can be found via the Staff tab on Blackboard, along with the route to accessing your Blackboard module site, which was demonstrated during the webinar. The option to review and reuse existing content was highlighted, and a tour of an exemplar site showed how a course could be organised; following the protocols and making the most of the tools available. A quick walkthrough of adding a profile picture to your site, and making a screen-recording introduction to your course then followed. A additional question asked outside of the recording was about creating a banner on Blackboard. This entry was posted in Staff Development and tagged Blackboard, learning technology, Staff Development, technology, Webinar. The Blackboard course creation route has remained largely unchanged for a number of years. Although it has worked well, it is fairly inefficient and is not robust enough to support future developments and tighter integration with SITS. Currently, apart from student enrolments, there is a lack of two-way communication between SITS and Blackboard for our module deliveries. All modules created in SITS (via a MAV) and completed with the correct data are automatically created in Blackboard however if the course should subsequently be removed from SITS then this is not reflected on Blackboard which has caused issues of incorrect sites being used. Students no longer associated with the MAV are not automatically removed from the Blackboard site. To begin working on a site a tutor needs to select a course from within Blackboard (this relies on the module site creation process above), redesign or apply the correct template and, if required, copy any existing materials across from the previous instance of the course manually. Once in place, Blackboard sites will only be created when the lead tutor is assigned to the MAV within SITS, this is critical as Blackboard sites will not be created without this data. Once the data has been entered on the MAV in SITS the Module Blackboard sites will be available to a tutor within a few hours. Requests for “non-module” Blackboard sites will be via a form request. The identified tutor will automatically be attached to the newly created site and will find it listed under “My Courses”, or within the “Pending” category if the tutor has enabled “Terms”. On selection of the site you will be taken through the two-step process of attaching a template and optionally, copying selected content from a previous instance. The basic site is now ready to add/update content and attach other tutors as required. If you plan to deliver a course where a number of modules are taught together then the system can help you create a combined site by prompting you to identify the modules (MAVs) to be included. Only students who are on the MAV will appear on the Blackboard site. The new system will be in place for all 2018/19 courses. System analysis, sector trends and our experience tells us that students are increasingly accessing learning materials via alternative devices year on year. Whilst analytical data from Blackboard confirms the traditional desktop is still top of the list for access, a significant proportion of logins are from mobile and tablet devices and has been increasing for a number of years. With our current system, display response to this wide variety of devices is difficult to predict but we are aware it can sometime cause issues, unpredictable behaviour and, on the whole, results in an inconsistent user experience. To help mitigate this frustrating user experience, we are developing a new interface using a Responsive Web Design approach. Responsive Web Design will make the site mobile-friendly and improve the way it looks on devices with both large and small screens as it automatically scales, reorders and prioritises content and elements to match the screen size on which it is viewed. It also keeps images from being larger than the screen width and prevents users on mobile devices from needing to do extra work to read content. The Blackboard App is constantly being updated, and the responsive theme will work in conjunction with the App to provide a much more seamless experience when using a mobile device. As part of this project theme functionality, the Homepage and other “non-course” areas will be reviewed to provide a much more engaging experience. The annual system update will take place during summer. The date has yet to be arranged, but it is likely to be at a similar time to previous years – around the end of July / early August. 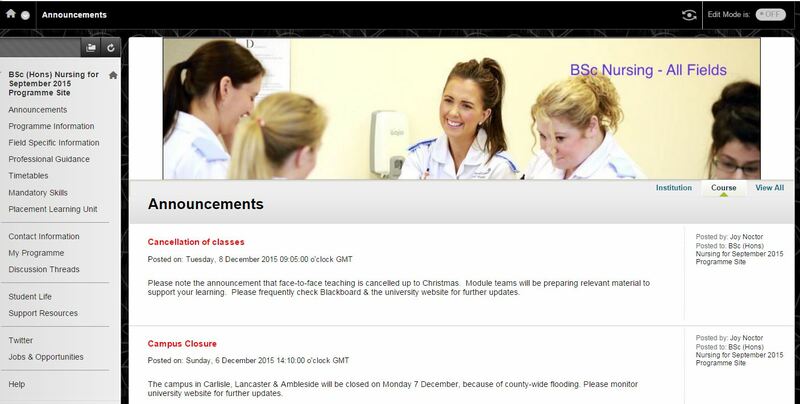 Please be aware that Blackboard will be unavailable for up to 24 hours during the upgrade. Support for current client software – operating systems, browsers, etc. We will publish further information regarding dates and any new features of interest as soon as they become available. Details and descriptions are subject to change, and more information will be circulated as necessary and as it becomes available. This entry was posted in LT News and tagged Blackboard, Blackboard 2018 updates, learning technology, technology. The system updates highlighted in February are now in place. Early August has been a time for refreshing some of our core learning technology systems. Medial has been updated to Version 5. The PebblePad update replaces legacy Flash technology with HTML5, which, along with a redesigned interface, makes the system more intuitive and accessible. Find out more …. Turnitin’s Feedback Studio has all the same features as the previous Document Viewer, however the interface makes better use of space, and is more accessible and responsive. Find out more …. This entry was posted in LT News, News, Stay up to date and tagged Blackboard, learning technology, Medial, PebblePad, Turnitin. PebblePad has moved from v3 (used Flash) to v5 (uses html5). The main difference is to Pebble+ – the personal space within PebblePad – where assets are created, shared and stored. ATLAS, the assessment area within PebblePad, remains unchanged. Everything in your Pebble+ account has transferred over into the new version. Works on all mobile devices and looks and behaves the same, no matter what device is used. Drag and drop to add files to your asset store. Improved text editing functions – you can use your mouse to copy and paste text. All Assets and Resources are in one place – no separate tabs for shared assets any more. PebblePad v5: click the link to see what the new interface looks like; how to create assets; upload files; share with people or for assessment and Alumni information. Academic PPDR instructions: click the link to find out how to fill out your Academic PPDR for the first and subsequent years. Don’t forget, you can take your PebblePad account and all its contents with you if you leave or graduate from the university and you can continue to use it FREE forever. Just register for an Alumni account before you leave or graduate. This entry was posted in Blogs, Good Practice, LT News, News, Staff Development and tagged learning technology, PebblePad, Staff Development. What was the problem/challenge you were trying to address? The Pre-Registration Undergraduate Nursing Programme used one large Blackboard site per cohort. With multiple instructors across multiple locations, all modules (28) were within this one site. Announcements were often sent to all users when they should have been targeted to a specific group of students or a specific site. For Instructors undertaking marking, the numerous Turnitin portals made it difficult to find work to mark, and this also applied to External Examiners reviewing work online. For students, there were a number of Turnitin portals for modules and this sometimes led them to submit to all portals they could see (just in case….) due to confusion. We adopted SITS-linked module sites initially for all first years starting in September 2015 (including the Working Together modules). The rationale for starting with the first years was so that this was accepted as the way they would see their modules, and not seen as a change half way through their teaching. It would become the new ‘norm’. The other programmes would continue on the old-style sites until completion. In addition, we created a whole cohort Programme site for generic programme-level information that applied to all pathways. Information included External Examiner reports, student forum reports, job opportunities, programme overview (which included placement information, timetables and holidays) and PSRB specific information. This is a non-teaching site. By using the module approach for teaching, communication was much more targeted and students were clear about where to look for module related information. We were also able to link to electronic reading lists. On the whole it has been a positive experience. Staff on each module know where they are posting information/resources. Marking is easier to access and the new External Examiners’ reviews have been easier to find. The module teams have reported that they enjoyed the freedom to develop their module specific sites based on the template applied, and some changed the look-and-feel of the site by changing the banner/colour schemes, etc. Negatives: Staff needed to get used to having a long list of sites on their Blackboard My Institution page. We had to be careful about the naming of each site so that the cohort was clearly identified, as staff would be teaching the same module for both the September intake as well as the March intake. Lessons learned: Use of groups when large numbers of students were involved was very helpful. Groups can be created which the students don’t see, but can be used for administration, for example, groups for each pathway or site of delivery. This then enables more targeted site or pathway specific information to be delivered. We could also use these groups for marking when multiple teams are working on the same module. 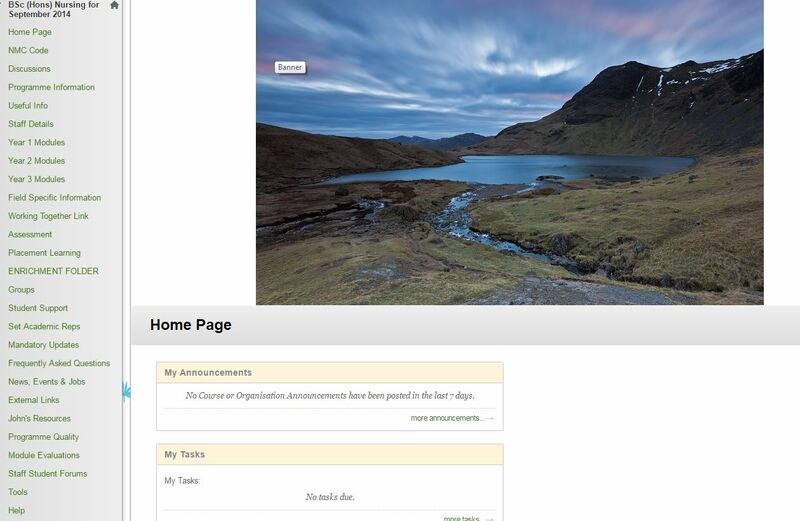 We also discovered that a single submission portal for assignments means it is clearer for the students to submit to. Previously, we had made portals for each site and pathway and for extensions and students had submitted to more than portal when unsure which one to submit to. We were also using anonymous marking, so these errors were not immediately apparent. Have you adapted/changed anything subsequently? Since then, the subsequent intakes are all on SITS-module sites and staff are now used to this way of working. What is the evidence on the impact of students and their learning? The changes we made were not to the way that we delivered our teaching, but more to the administration and organisation of our delivery. Students just see this as the way we work, so it is difficult to measure impact. However, we are certain that students are now clear where to look for information and also, where to submit their assignments to. We review the template each year to ensure that it reflects current information and is user friendly for both students and staff. Staff are being encouraged to implement further use of educational technology within their sites, such as podcasts, narrated PowerPoints and we hope to develop the use of PebblePad further within the programme. As we used one Blackboard site for 3 years of study, the Turnitin submission points became very busy. At the end of the three years, this site had 95 separate submission points. This entry was posted in Case Studies, Good Practice, HS Case Studies and tagged Blackboard, learning technology. The ELESIG (Evaluation of Learners’ Experiences of e-learning Special Interest Group) North West group meet at Liverpool John Moores University on 15th March. This was an afternoon event, which began with Dr Amanda Mason & Jim Turner from LJMU feeding back about a project to set-up and run a virtual Journal Club. Dr Rod Cullen from Manchester Metropolitan University then discussed how they had used data from a student survey to gain some insight into students experience of TEL. A greater level of consistency across the student experience was a key finding – the most vocal reports were often when a student had a good experience on one course and a poor experience on another. Other themes emerging were communications (clarity around how often & when to respond, for example), VLE content & organisation (timeliness of content, clarity of purpose, organisation, etc. ), and an interactive teaching & learning experience (a desire to be involved in learning & teaching, not just passive recipients of information). Most of the issues were around learning design, rather than the technology. One idea was for better discussions with students regarding expectations with technologies, and how they can/should be used in their studies. Daniel Roberts and Tunde Varga-Atkins from the University of Liverpool discussed a minimum standards VLE baseline. They found that the staff who were aware of the baseline, were generally positive about it, but didn’t want it to be too prescriptive, whilst 95% of students surveyed felt that a baseline was important – again, highlighting the need for consistency (students reported less provision on the VLE than staff thought they were providing). Ashwini Datt from the University of Auckland then talked about a couple of MOOCs her university had developed and run. She discussed the idea of MOOC blending – where some of the resources for the MOOC were used in “on-campus” courses. Professor Rhona Sharpe from Oxford Brookes University then discussed “rising to the challenge of education in the digital age”. She talked about the diverse ways that learners respond to technologically rich environments, and how it is difficult to generalise. She felt that learner voices were important, as the student experience is a strategic priority, however internal systems can be slow to adapt to rapid technology changes. Currently, the focus is on blended learning, digital literacy, distance learning & MOOCs. The goal is to prepare learners for the digital world; a global, networked society. Users need to be confident users of a range of technologies for personal, academic and professional use. As with most of the speakers, consistency was again seen as vital. Curriculum redesign was happening with multi-disciplinary teams to help ensure consistency and embedding of digital skills. A mapping exercise using the Jisc NUS Benchmarking Tool was also mentioned. A very useful session, highlighting again a number of key areas that can help support the student experience and develop vital digital skills. This entry was posted in Conferences and tagged conference, learning technology, Research.